What are the benefits? What is POP3 in the first place? OK, let’s take a look first. POP3 is defined by The Internet Engineering Task Force as “Post Office Protocol – Version 3” and basically, “Post Office Protocol – Version 3” or simply POP3 is a way for you to receive e-mails from a mail server. A more in depth look at POP3 can be found here. SMTP which stands for “Simple Mail Transfer Protocol” is used to send e-mail. That is all there is to know but if you want in depth explanations, go here. The benefits? We’ll talk about web based e-mail first, where most are free such as Yahoo Mail or Hotmail. The 2 hot favourites of the Internet Community. Almost everyone I know has at least one or both or even a few of each account(s). Don’t ask me why, ask them. Now, when you read your mails, you have to login to Yahoo Mail (we’ll use Yahoo for example throughout for this article), read it, reply to it, do some housekeeping like deleting SPAM mails or other junk mails. Then you log off. So all is fine, you have replied to that important message that your friend (David) told you about his new home address, telling him that you acknowledged it. Now you log off, went on your way home, you met another friend, he ask if you know that address of David. Oops, you didn’t jot it down anyway with you. You will need to go to a PC with Internet access so you can plug your laptop online and access your web based e-mail again….or it can be more devastating!What if it was an important presentation? An important contract sent as attachment? ok ok you argue that there’s now Palm tops etc or you could have jot it down/ edited in your “Address Book” David’s new address etc but the point isn’t this. The point is that if you have been able to download your mail, you would be able to access that mails via your laptop anywhere you were with your laptop. Not to mention you won’t have to worry about exceeding your mail quota (which by the way is only 6 pathetic Mb on Yahoo!) and no more mails can be sent or more importantly received! Download you mails! You’ll just need POP3 access. 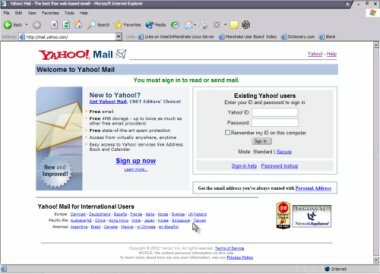 Since Yahoo has since changed to allow only pay customers to download their mails to e-mail clients (such as Outlook Express or Outlook), POP3 is useless! Never fear, the open source community has created a little program called YahooPOPs which will allow you to do download and sent your mails via e-mail clients and it WORKS! For Hotmail users, you can try out HotPOP3, which should work, as I have not personally used it before. So now you see, using POP3 to download your mails will allow you to prevent quota exceeding problems and have your mails with you. yes, leaving them online will allow you to have access to the mails anywhere WHEN you have Internet access and so the final decision still lies with you if you want to download your mails or leave them on Yahoo/ Hotmail or other web based e-mail services.